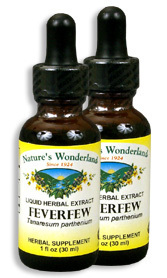 Feverfew Extract, 1 fl oz / 30 ml each (Nature's Wonderland) - Penn Herb Co. Ltd.
Feverfew is a cooling herb used since the 1st century to maintain head comfort. Its natural circulatory and muscle relaxing effects make it an effective alternative for head well-being. Rediscover the flower power for yourself! DID YOU KNOW: Feverfew belongs to the same botanical family as sunflowers and daisies? AMOUNT PER SERVING (500mg/ml or 30 drops): Certified Organic Feverfew Herb (Tanacetum parthenium). OTHER INGREDIENTS: Grain Alcohol (40-50% by volume), Deionized Water. Free of: milk, dairy, egg, fish, shellfish, tree nuts, peanuts, wheat, gluten or soy. Supports head well-being; supports blood vessel tone; supports healthy blood flow to the brain; supports a healthy female cycle; eases menstrual cramps; supports joint health. Supports healthy liver function (traditional bitter tonic). 20-40 drops in water or juice, 2-3 times daily, or as needed. Shake well before using. NOT TO BE USED DURING PREGNANCY. CONSULT A HEALTH CARE PRACTITIONER BEFORE USE IF TAKING BLOOD THINNING MEDICATIONS. NOT RECOMMENDED FOR USE BY PERSONS WHO ARE ALLERGIC TO DAISY, RAGWEED, AND OTHER RELATED PLANTS.